We’re excited to share the last part of our blog post series for the home extension in Clematis, Victoria. Parts 1, 2 & 3, can be found on our Builders Blog. The “internal fit out” is the time when the new internal spaces start to take form and the structures start to look like new rooms.It allows the area to become suitable for occupants. It is the final stage of an extension and means the end is near!! Insulation – most house plans will request insulation in the external walls and ceilings. The type of insulation is determined by the energy rating of the home. In some cases, like his extension, the energy rating of the home required the flooring to also have insulation. 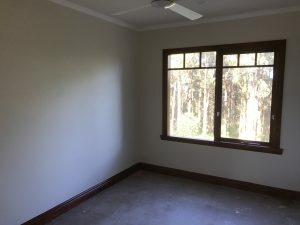 Plastering – once the walls are plastered, you can really see the rooms take shape. The walls are no longer hollow (you can’t see the frames anymore! ), so the rooms have a clear border. 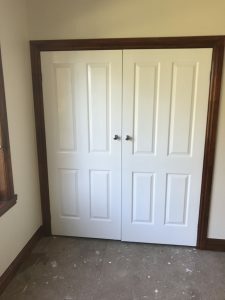 Door Installation – the doors and door frames are installed once the plastering is completed. 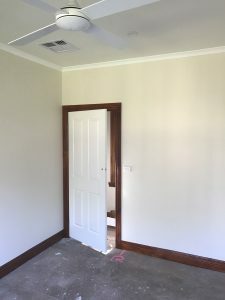 Architraves & Skirting Boards – the door and window architraves and skirting boards are the last to be installed. These are finishing touches on a room. For this extension in Clematis, there was some work involved in matching the new fixtures with existing fixtures to ensure the rooms are similar. Painting – painting is the final stage of the fit-out where you can be creative and use colours and textures to give each room their own look. We hope you’ve enjoyed our blog series on this extension. We hope you might have learnt a thing or two along the way as well! Top Shelf Building & Carpentry are available for free quotes for all your extension and renovation needs. Please contact us or phone 0418 529 002.